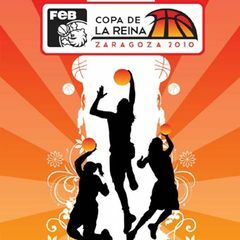 Mann Filter Zaragoza are the hosts of the 48th edition of the Copa de la Reina basketball tournament in Spain. Former Aix-en-Provence and USVO star Allison Feaster-Strong who returned to Spain this season after a year in Italy is a member of this club. Ros Casares, Halcon "Perfumerias" Avenida and Rivas Ecópolis qualified for this edition of the Queen’s cup by finishing in the first three places of the Spanish league at the midway point. The Spanish Federation decided to reduce the number of teams from 8 to 4 to generate more interest in the competition. While there are a number of players who have played professional basketball in France amongst the participants, with the exception of Feaster-Strong, there are no French players on the roster of teams that qualified. In the first semi-final Perfumerias Avenida beat Rivas Ecópolis (90-53) in front of 2300 spectators. Defense was the order of the day during the first quarter. The hosts, Mann Filter kept the defending champions scoreless for more than two minutes while scoring 6 points. Ros were opening their account with Erika De Souza from the free-throw line. Although she missed her second attempt Delisha Milton-Jones grabbed the rebound to put the ball back. After three minutes the hosts were leading (9-5). Belinda Snell settled Ros Casares’ early nerves with a trey that finally set them on their way. Mann Filter’s defense held out for most of the quarter. They were unable to score during the last two minutes. Ros Casares finished the first quarter with trey by Anna Montañana to lead (19-14). The guests continued to keep Mann Filter away from the basket while stretching their lead with an inspired Amaya Valdemoro firing in 17 points to go ahead into the locker room (45-28). The game lost its fluency in the third quarter with both teams struggling to score. The hosts’ task of coming back became more difficult with Agne Ciudarene having to sit on the bench with 4 fouls. The quarter ended with a flurry of baskets with the defending champions more or less ending the game as a contest leading (63-37). The last quarter played itself out with the bench players from Ros Casares having most of the time on the court. Serbian international Ljubica Drljaca, who had spent the last ten years playing in France, came on during the final quarter and scored 2 points for the defending champions as they cruised to victory (75-52). Valdemoro led all scoring with 19 points, while De Souza and Snell contributed 13 and 10 points apiece. Montañana finished with 9 points and 5 assists. 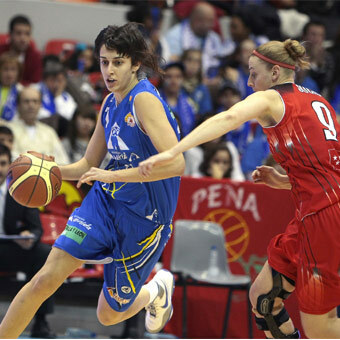 For the hosts Ciudarene led the way with 10 points while Cristina Ouviña had 9 points and 6 assists. Last season Perfumerias Avenida had hosted the Copa de la Reina and were eliminated on the first day. Perfumerias Avenida got off to a slow start against Rivas Ecópolis. They were leading (15-11) after eight minutes thanks to the skill of Alba Torrens (left) and the scoring in the paint of Sancho Lyttle. Avenida then stepped on the accelerator and finished the first quarter with a 10-2 run going into the second quarter ahead (25-13). Avenida went to work on finishing the game before the break with Le’ Coe Willingham and Alexandra Gorbunova joining the duo of Torrens and Lyttle offensively to go into the interval leading (49-28). Riva failed to score during the first five minutes of the third quarter and found themselves chasing a 30-point deficit (58-28). They threw in the towel and both teams rotated their players for the rest of the game. Perfumerias Avenida won the match (90-53) with 21 points coming from Torrens.